This quick and easy deviled eggs recipe is a must have for your holiday meals. Keep reading to learn how simple it is to make them! I make this holiday deviled eggs recipe for every special occassion throughout the year. It’s tradition! Holiday meals just wouldn’t be the same without them. This is the same easy recipe for deviled eggs that my grandmother used, and probably her grandmother as well! You can jazz it up if you like by using a flavored mustard. You can also add additional spices or seasonings, like crumbled bacon or green onion, but we love it as-is. Over the years I have made hundreds of deviled eggs and have been frustrated by peels that pull off part of the egg white with it. I have tried many suggestions and finally learned the trick for easy to peel hard boiled eggs. It has to do first with how you cool the eggs and second with how you peel them. You need to start by hard-boiling a dozen eggs. Most people boil their eggs, but I steam the eggs. I put 2-3 cups of water in the bottom of the pot. Then I put all 12 eggs in the steamer pot basket along, with my color-changing egg timer. My egg timer is red when you first put it in with the eggs (as you can see above). The eggs are done as soon as the timer completely changes color – mine turns a deep purple. Keep a close eye at the end and pull the eggs right when the timer is completely purple. If you don’t want green around the edges of your yolk, it is important to pull your eggs out right after the yolks are completely cooked. 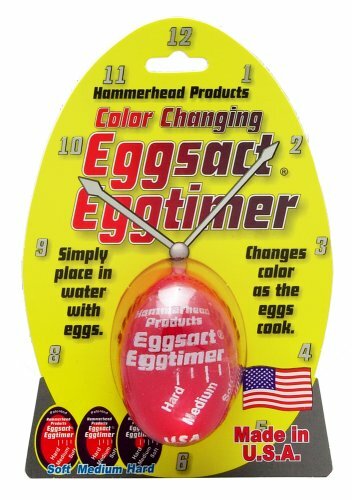 That’s why I use a color changing egg timer. I get perfect results every time! Immediately after the eggs have cooked, you want to transfer them to an ice water bath. One trick for easy to peel hard boiled eggs is to crack them a little before you put them in the ice water. This allows some of that cold water to seep in and help separate the shell and the egg. Allow the eggs to completely cool in the ice water. I leave them in there until the ice has melted completely. When you are going to peel your egg, crack it all over. Then roll it under your palm back and forth several times to loosen the shell before you start to peel it. I have never had any egg whites stick to the shell since I started using this method. Peel all 12 eggs. When I was little and helping my mom make deviled egg filling, we would just use a fork to mash it up. However, I recommend using a food processor. It not only speeds things up, but it ensures that the filling for this quick and easy deviled eggs recipe is smooth and lump free. Cut each of your eggs in half lengthwise. Place the egg white shells on to a serving platter and then set aside. Put the yolks into a food processor. Process until the are powdery. Add your mayonnaise, mustard, and sugar. Process until it the mixture is well blended and smooth. You may need to scrape the sides down and process again to ensure that all the ingredients got incorporated. At this point, you can just spoon your filling into the egg white shells, sprinkle them with a dusting of paprika, and call them done. However since I usually only ever make deviled eggs for holidays or special occasions, I take it a step further. My secret to pretty swirled filling for this quick and easy deviled eggs recipe? I use a Wilton decorating gun! You might remember that I also used it to make my Meringue Ghosts for Halloween. It seems I never use it for piping icing like it is intended to be used. Nevertheless, my trusty Wilton decorating gun is a much used tool in my kitchen! Anyway, I just remove the top and fill the decorating gun with the deviled egg filling. 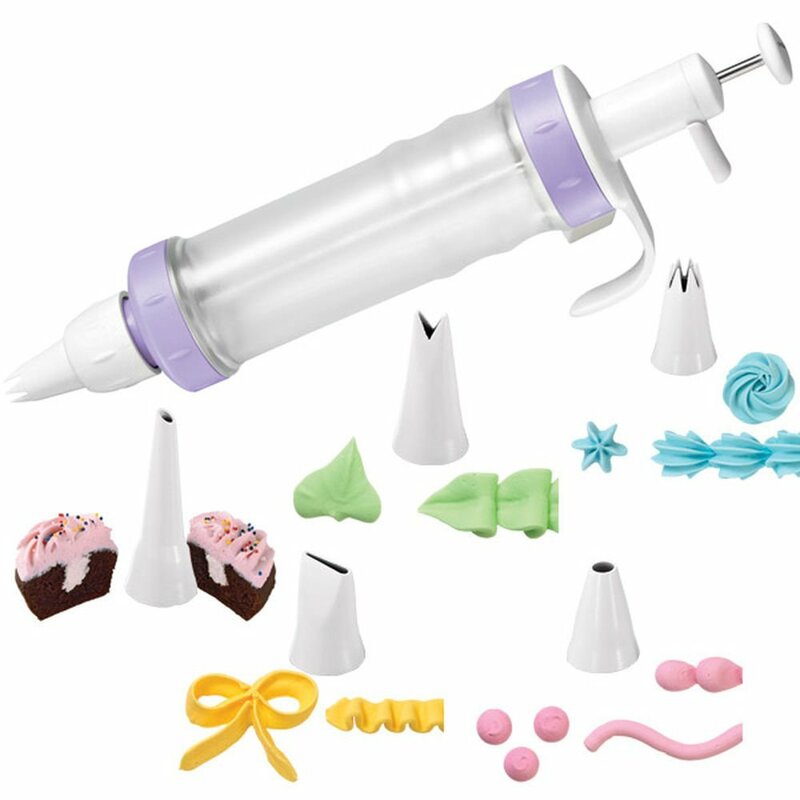 I put a Wilton #21 Star Shaped Icing Tip into the nozzle of the gun. That will give pretty swirls to your filling. Just press down on the trigger of the decorating gun and swirl as you fill the hollow of the egg shells. It doesn’t take any longer to fill the eggs this way than it does by using a spoon, but it makes for a gorgeous presentation. After you have filled all the egg white shells, sprinkle with a dusting of paprika. Aren’t they pretty? These easy to make deviled eggs will keep in your fridge for 3 days or so, but they never last that long at my house! To print this easy recipe for deviled eggs, just click on the little print icon below. Hard-boil the eggs and allow to cool completely in an ice water bath. After the eggs have cooled, peel and slice in half lengthwise. Add the yolks to a food processor and process until powdery. Add the mayo, mustard, and sugar. Process until smooth. Spoon or pipe the filling into your egg white halves. Sprinkle with a dusting of paprika. I make this quick and easy deviled eggs recipe for nearly every holiday. In fact, my kids get a bit upset if I don’t make it! I will definitely be making a big batch of these easy to make deviled eggs for Thanksgiving next week. So tell me… Do you have any special recipes that you make for every holiday? If you enjoyed this easy recipe for deviled eggs, you might also enjoy…. Free Gift With Stampin Up Purchase! because everything is better when it's handmade with love! Creatively Homemade features inspiration and ideas for yummy recipes, money-saving DIY projects, and fun crafts to make for and with your family. I am a Child of God, Wife to my High School Sweetheart, Work at Home Mom to 4 Great Kids, Memory keeper, Crafter, Letterboxer, Blogger, Frugal Shopper, Organic Gardener, Avid Cook and Baker... yep that about sums it up! Trisha on Pretty DIY Candy Treat Boxes ~ Holds 3 Ghirardelli Chocolate Squares! Creatively Homemade participates in the Amazon Associates program as well as other affiliate programs. The links on this site may be affiliate links. This means that we earn a small percentage of any sales generated from these links. This helps to support this website. If posts are sponsored or if a complimentary product has been received for review, it will be stated at the beginning of the post. The content of this blog is protected by US copyright law. Please do not use any materials from this blog without permission. Copyright 2015 Creatively Homemade. All rights reserved.